Conceptual blending allows the emergence of new conceptual spaces by blending two input spaces. 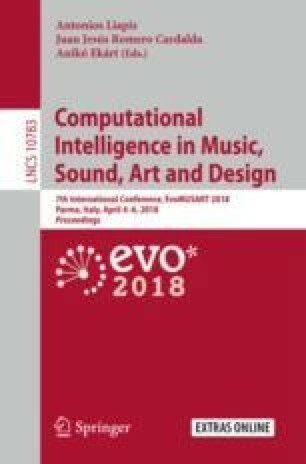 Using conceptual blending for inventing new concepts has been proven a promising technique for computational creativity. Especially in music, recent work has shown that proper representations of the input spaces allows the generation of consistent and sometimes surprising blends. The paper at hand proposes a novel approach to conceptual blending through the combination of higher-level features extracted from data; the field of application is drum rhythms. Through this methodology, the input rhythms are represented by 32 extracted features. After their generic space of similar features is computed, a simple amalgam-based methodology creates a blended set of an as equally as possible divided number of the most salient features from each input. This blended set of features acts as the target vector for a Genetic Algorithm that outputs the rhythm that best captures the blended features; this rhythm is called the blended rhythm. The salience of each feature in each rhythm in the database of input rhythms is computed from data and reflects the uniqueness of features. Preliminary results shed some light on how feature blending works on the generation of drum rhythms and new possible research directions for data-driven feature blending are proposed.